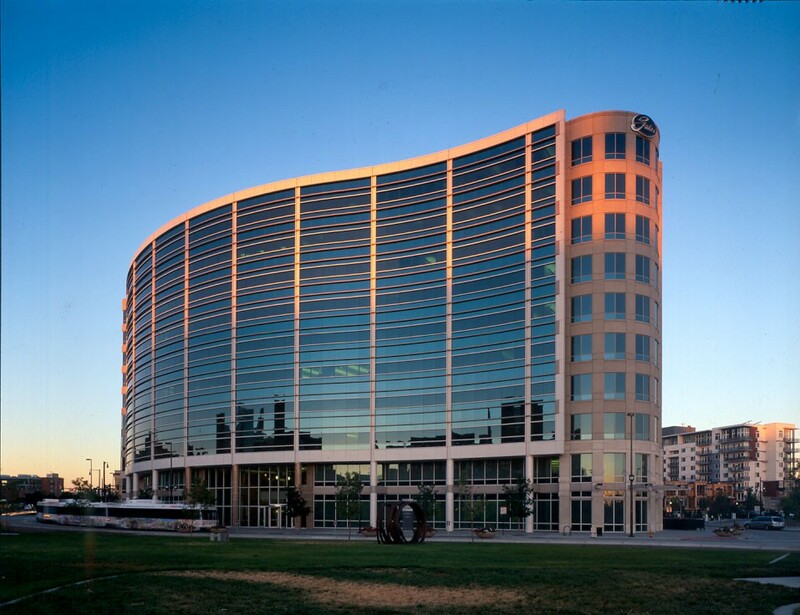 VF Corporation recently selected 1551 Wewatta Street in Denver’s LoDo for its new global headquarters (Photo: Viracon). 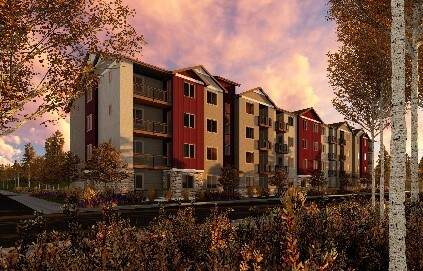 DENVER – Marcus & Millichap recently released its 2019 Multifamily Investment Forecast Report that includes metrics and analysis of 50 metros across the U.S. and Canada. According to the report, accelerating household formation, underpinned by the tight labor market, will continue to support rental demand in 2019. Evolving recruiting practices and shifting demographics will favor a variety of metros, including several smaller cities. In addition, tax reform and subdued single-family home sales will restrain the national vacancy rate despite record apartment construction levels. The coming year offers a dynamic climate for investors. High-quality jobs proliferate as corporate expansions boost employment growth. A talented labor pool is bringing many new companies to the Colorado Front Range and they are creating a number of well-paying positions. Cloud-based software firm Xero recently opened its new headquarters in LoDo, while VF Corp., a worldwide apparel and footwear company, has plans to open its global headquarters in downtown Denver in 2020. 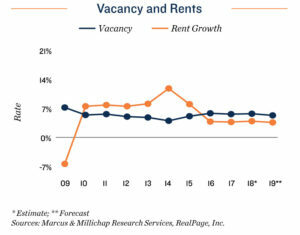 The inflow of degreed positions is sparking demand for Class A and B units, pushing vacancy rates for these asset classes into the lower-5 and mid-4 percent bands, respectively. As the number of available apartments declines, developers will be adding more than 14,000 rentals to the market, many of which will be luxury units. The urban core will receive a sizable portion of the new supply, particularly the Five Points neighborhood where more than 1,000 units will be finalized in 2019. In addition, Capitol Hill will witness the completion of nearly 400 apartments as the area’s revitalization efforts progress. Demand for apartments will remain strong in 2019, and the average effective rent will rise by more than 3 percent. Urban assets garner elevated interest. As value-add options in Capitol Hill continue to diminish, investors will likely increase their interest in the East Colfax corridor near the UCHealth University of Colorado Hospital. Here, cap rates in the upper-6 percent band are achievable, attracting many private buyers, particularly those targeting assets under $2 million. Neighborhoods closer to the urban core just south of City Park will lure investors with similar criteria, though cap rates in this area will be up to 50 basis points lower due to the proximity to the city center. Moreover, buyers are being more selective and focusing on assets near the core, also applying downward pressure on yields in and around Downtown Denver. The bidding for outer-ring suburban properties, meanwhile, remains relatively subdued, widening the bid/ask gap and potentially encouraging owners to lower pricing in correspondence to market conditions. Job growth surpasses 2.0 percent for the ninth consecutive year as Denver employers add 36,000 new workers to payrolls. 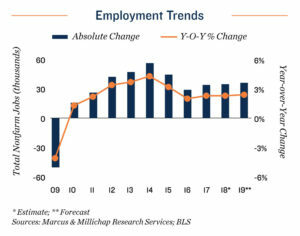 The healthcare and tech sectors remain key drivers of job creation. 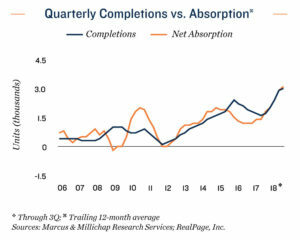 Apartment developers will surpass last year’s cyclical high of 13,600 apartments. In 2019, the urban core will remain the center of attention. The net absorption of more than 14,500 units helps push vacancy down to 5.3 percent after a 10-basis-point rise one year earlier. Rent growth falls just shy of the prior three-year average of 3.8 percent as the average effective rent rises to $1,500 per month. 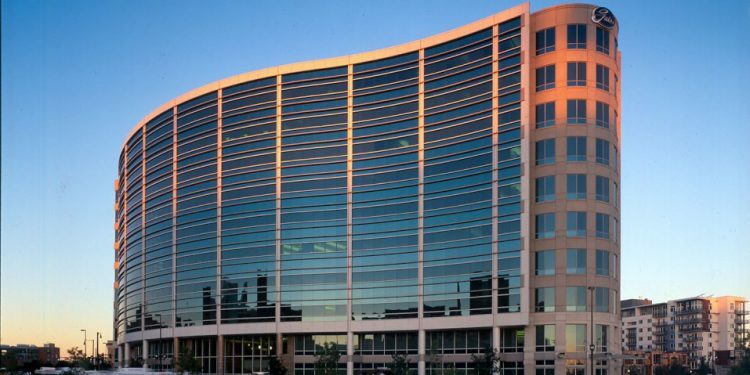 Investors will expand their search parameters to Denver’s Northwest Corridor as employment and household gains accelerate, generating more rental demand in this area.